Least Tern - White Rock Lake, Dallas County, July 31, 2009. Least Tern. June 11, 1988. Millers Creek Lake. Throckmorton County. I noticed a lot of waterbird activity including some flying Least Terns on several of the stops of the Weinert BBS that skirt the southern side of Millers Creek Lake in June 1988. After I completed the BBS route that morning I returned to the lake to investigate further. As I walked towards the water I was suddenly mobbed by a dozen or more Least Terns. Realizing that I had accidentally walked into a breeding colony, I carefully retreated and then photographed from a distance. Least Tern nest and eggs. July 3, 1988. Millers Creek Lake. Baylor County. A few weeks later I returned to Millers Creek Lake to continue work for the Breeding Bird Atlas project. 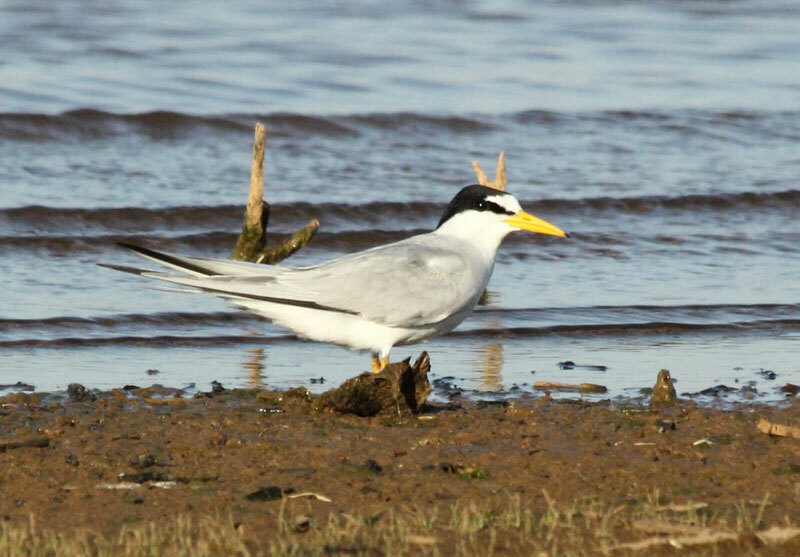 I was driving along a rough fisherman's track on the north side of the lake in Baylor County when a spot of white between the road and the water I thought was a piece of litter suddenly took flight as a Least Tern. I grabbed a camera and quickly walked to the spot. Though I had mentally marked the square yard or two the bird had flown from pretty well I could not see a nest at first. Fearing after a minute or two that I was keeping the tern off its nest too long in the hot weather, I was just backing off when I spotted the eggs at the edge of the small area I had been searching. I took two quick photos then left. Within seconds of driving on I saw the tern return to its nest in my rear view mirror.